Much of the island is accessible through ancient paths, restored over the past years, through thick maquis, with heather, and chestnut trees, contrasting with the apparent aridity that characterize the landing and the villages of Filicudi. On the cliffs of the western part of lives a colony of Queen hawk (Falco aeleonorae), while other pairs nest on the nearby stack of Canna; here lives one of the last populations of black lizard Aeolian (Podarcis raffonei), the only vertebrate endemic in the archipelago today seriously threatened. 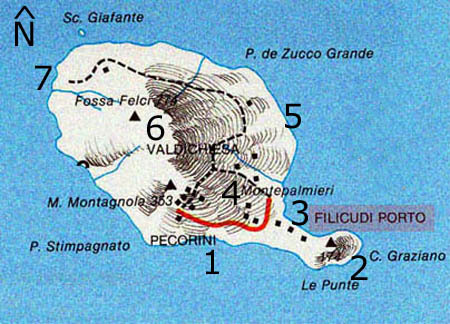 Filicudi with Alicudi is geologically the oldest of Aeolian. The findings show that the island was inhabited in very remote. The Greek age has left few traces of settlement and ceramic. They were found fragments of pottery demonstrating commercial relations with the Aegean. The story of Filicudi follows that of the other islands: invasions, resistance, victories and defeats, dominations and pirate raids. Trekking from Fossa delle Felci, whose summit is reached by Valley Church, you can see a wonderful view on the Islands. The coasts of Filicudi have uncommon beauty: narrow valleys, cliffs dirupate, deep caves. Of great effect is the visit to the Cave of Bue Marino in which the play of light and the noise of the sea seem to imitate the bellow of ox. Not far away stands the rock of Canna beloved by divers for fishing for coral, sponges and lobsters. A North admires the spectacular Punta Zucco Grande, with its ten layers of lava.